Need more information about booking Home 5710130 ? Upon entering Florida Delight you will arrive at the first of two sitting areas found in the downstairs level of the villa. It is a large, welcoming lounge area, beautifully laid out with two leather three- seater sofas and an armchair, coffee table and lamps. We have recently installed a TV with Netflix in the lounge upon a request from a former guest. We have already had feedback that this TV is proving useful for when families with children are renting the villa so that they can relax and watch cartoons or a film of their choice in the lounge whilst the larger 65 inch 4K TV in the Living Area is being used for watching sport! A bar area just off the lounge is convenient for fixing snacks, pouring drinks and having everything nicely to hand. It is here that you will find the board games and cards, as well as various local attraction leaflets and booklets. There is a black leather book here in which we welcome any comments and reviews from guests staying in the villa. In the top cupboard on the right you will see a number of reading books left by previous guests. Please feel free to help yourself or leave a book that you may have finished reading whilst on your holiday. Future guests will always appreciate them. If you are in the mood for a board game or cards the lounge has a circular table and four chairs which is perfect for playing for a small number of people otherwise there is a very large table in the dining area for the game nights for the whole family. A downstairs toilet is situated adjacent to the lounge. From the lounge situated at the front of the villa you will wander through into the stunningly spacious open kitchen, dining and family living area. This is the true hub of the house. The entire ground floor living area is fully tiled in the same stylish floor tiles which add to the sense of light, space, flow and continuity between each of the rooms. Large patio doors give the Family Living room direct access and views onto the pool area and also bring in a lot of natural light. The Family Living room is the perfect place to relax and enjoy a film on the large 65 inch 4K TV which has superb picture quality and is fantastic for sports fans or watching a good film. We have all the major US, UK and European networks as well as Netflix available on any of the nine televisions available throughout Florida Delight. Just imagine yourself sinking into the large, luxurious leather sectional seating area complete with chaise lounge for laying back and relaxing. This is THE place to chill out and enjoy a good movie with all your friends and family. Within the villa we have provided two different telephone lines for your convenience. The black phones are for free local calls within the US and these two phones are found in the Family Living room and the Master Bedroom One. There is also a red phone located in the Family Living area which is for free calls to many countries, as can be found listed on the Saver section of our website. Within Florida Delight you have a wealth of options when it comes to choosing where to dine. There is an impressive inside, formal dining table with leather chairs, which comfortably seats up to 12 people and is a real showpiece. With great views overlooking the pool area, it is flooded with natural light but being indoors the air-conditioning ensures a cool, comfortable temperature. It is the perfect place to dine when you want a change from eating al fresco. Being situated next to the kitchen it makes preparing and serving meals easy and very convenient but with the recent installation of very attractive light fittings above the table you can dim or brighten the lighting according to the mood and ambience you wish to create during mealtime. If on the other hand you just want a casual bite to eat or a coffee there are four bar stools at the breakfast bar to sit, chat and enjoy a leisurely snack. There is also a smaller table and four chairs in the front lounge. We have recently added to the outside dining options by purchasing a new 10-seater dining table and chair set which is located under the patio canopy and is ideal for large family mealtimes in the evening or when you want shade from the sun during the daytime. On the far side of the pool decking is another dining table, 6 chairs and an umbrella for when you want to keep the sun off. This is a favourite spot for enjoying breakfast and watching the birds and squirrels in the trees. We have installed additional screening so that you can enjoy the best of outside living in private. The whole of the pool decked area has solar lighting so that you can enjoy being out by the pool in the evenings either for a meal, drinks or a swim. In addition the flood lighting in the pool always helps create a lovely ambience too. With the luxury of space, granite work surfaces, quality appliances and equipment, the kitchen offers everything you need to make home cooking and entertainment a pleasure. Your own state of the art kitchen for when you want to have a change and “eat in”. This kitchen is superbly equipped with every modern convenience, including an American style fridge/freezer and ice machine, a small additional fridge which is great for cooling beers or wine, a large modern oven, microwave, dishwasher, toaster, blender, electric kettle and a waffle maker. There is even an Instant Pot which is an electronic/computerised pressure cooker or slow cooker. The Instant Pot is fabulous for when you want to create a family meal within a short period of time or get a meal into the slow cooker before you head out for a busy day in the parks so that you can come home to a hot meal at the end of the day. There is as all the crockery, cutlery and cookware you could possibly need. There is also a complete second set of stylish, quality plastic crockery and glasses (a necessity for your safety) to use in the pool area. As a keen cook myself, I do try to ensure that Florida Delight is as close to home as possible when it comes to the kitchen as there are so many things we would miss when cooking. In America it is common to have the laundry facilities on the second floor next to the bedrooms, which makes a lot of sense really. Florida Delight has its own washing machine, separate tumble dryer, iron and ironing board located on the vast landing area upstairs. This is so handy for when you want to get a load of washing done, particularly for families with babies or young children. Also means you can choose to take less clothes on holiday, leaving precious space in suitcases for bringing home all those exciting purchases you have made in the Florida Malls! There is a large cupboard containing all the towels you will need both within the villa and around the pool. Upon your arrival you will also find each bathroom has been made up with clean towels as well as the additional ones found in this cupboard. Florida Delight has a large games room complete with pool table, air hockey and table football. There is also a wall mounted 40“ Samsung HD TV. With two raised bar stools and table, there is a welcome spot for having a break from all the excitement and to sit and enjoy a drink or just have fun watching everyone having a great time. This games area is sure to be a winner with any member of your party, whatever age. The six bedroom accommodation comprises two king suites, two queen suites, one twin-bedded room and one room with bunk beds. The king and queen suites have their own private adjoining bathrooms. The twin bedroom and bunk bedroom share a bathroom although access is through their own separate doors. In addition to the air conditioning throughout the villa, the king and queen bedrooms have the luxury of integral ceiling fans/lights. All of the bedrooms have been decorated to give them their own individual look and appeal. Unlike some rental properties, Florida Delight has the benefit of both blinds and curtains in each bedroom to give you both privacy but also that extra touch of style and luxury. All the bedding is provided and the beds are beautifully made up with clean, high quality and stylish linen before you arrive. Each of the bedrooms has its own 32” Samsung HD TV with Netflix. The villa has air-conditioning throughout, so will remain at a constant cool temperature that will make you feel comfortable throughout your stay whatever the temperature outside and will also help towards giving you a good night's sleep ready for your fun packed day ahead. Each bathroom is equipped with its own hair dryer, so that everyone can get ready quickly in the mornings to help you make the most of your valuable time. Every bathroom has a shower, all of which have been upgraded to quality units with doors. Each bathroom will be made up with towels for when you arrive and additional towels are located in the cupboard opposite the laundry area. There are also two baths in the villa, found in the two master bathrooms. These are perfect for when nothing other than a long, relaxing soak in the bath will do after a busy day having fun, as well as being a must for families with children still too young for a shower. Each of the bathrooms has a vanity unit with cupboard space and a large mirror. Throughout the villa, including in each bathroom, we have installed small night lights, for your convenience should you ever need to get up during the night and also as some children like a low level light at bedtime. Located at the rear of the villa this bedroom benefits from wonderful views over the woodland area behind the property. Completed with a large, comfortable king size bed in rose-wood, with high quality bedding and four pillows, two night stands and two lamps and a 32” Samsung TV and blue tooth DVD player and cordless telephone for free local calls. A stunning walk-in closet provides a vast amount of storage. The en-suite bathroom has the luxury of two wash basins, large vanity unit, a bath, a shower cubicle and a separate toilet. Located at the front of the villa with pretty arched windows. This bedroom enjoys the same style king size double bed, again in rose-wood as Master Bedroom 1. The bedroom is beautifully completed with high quality bedding and four pillows, two night stands and two lamps and a 32” Samsung TV. The en-suite bathroom has the luxury of a bath, shower cubicle, vanity unit and separate toilet. Each of the queen bedrooms are furnished with beautiful white furniture which contrasts perfectly with the fresh and vibrant colours of the bed linen. With queen sized beds, two night stands and two lamps, a 32” Samsung TV and large wardrobes, these bedrooms, just like the master suites, have every comfort to make your guests' stay a pleasure. The queen bedrooms each have their own en-suite bathroom with shower, vanity unit, toilet and a wall mounted hair dryer with a built in LED night light. A perfect bedroom for adults or children alike, decorated with the same fresh, white furniture as the queen bedrooms. With a 32” Samsung TV, night stand and lamp. This bedroom has an en-suite bathroom with shower, a wall mounted hair dryer with built in LED night light, vanity unit and toilet, which it shares with bedroom 6 (Jack and Jill) but each room has its own private access to the bathroom. A great room for children with sturdy rose-wood bunk beds, night stand, lamp and 32” Samsung TV and blue ray DVD player. The lower of the two bunks is in fact a double bed, which enables greater flexibility and options if another bed in required for an adult. This bedroom benefits from an en-suite bathroom with shower, a wall mounted hair dryer with built in LED night light, vanity unit and toilet, which it shares with bedroom 5 but each room has its own private access to the bathroom. As well as the spacious family living room and lounge downstairs, there is also the welcome addition of a large open loft area upstairs. The loft was created as a special area to relax or have fun playing on the PS4 games console with a range of games. This is attached to a 40” Samsung TV. A comfortable leather sofa provides the perfect spot for you to settle down for some serious gaming, enjoying a film or just relaxing for a quiet moment with a good book. We feel this is an area of the home that really adds to the general feeling of spaciousness and flexible living that Florida Delight offers you in so many ways. We have a high chair, stroller, cot and stair gates available upon request for those parties staying with a young child. There is also a safety fence in front of the pool which is always in place upon the arrival of new guests to the villa and is for the safety and protection of children. Guests staying without young children are able to take the fence down during their stay should they wish to do so. The Club House which is 5 minutes walk from the villa and free for any guests to use, has recently installed a large climbing frame/play area for young children. After a short stroll from the villa you will come to the Club House which is a very attractive and welcoming venue open to all guests to use whilst staying on Watersong. Inside the Club House there is a manned reception desk should you wish to speak to somebody. There is a small gym, which is open between 10am and 6pm. A separate room containing a table tennis table. Another separate room with access to computer terminals and Wi-Fi. A comfortable lounge area and toilets are also housed within the building. Go through the patio doors and you will discover a large outside swimming pool and a jacuzzi. There is plenty of seating around the pool in the form of either sun loungers or some table and chairs with sun umbrellas. The pool is a lovely spot to go to if you want a change of scene from your own pool at the villa or if you want to swim some longer lengths. It is also a great area to take the children, although they must be supervised as there is no lifeguard on duty there. Just outside of the pool area (which is in an enclosed fenced area), there is a volley ball pitch and a new children’s play area made up of a large climbing frame and slide. Florida Delight has been decorated and furnished throughout by a leading interior designer to an extremely high standard and quality for your total enjoyment and pleasure. As owners we are also continually adding to the villa in different ways such as with the purchase of extra outdoor seating. The high standards both we and our guests expect are maintained by our excellent local Management Team, Orlando Holiday Management LLC, who are on hand should you need them at all during your stay. An information pack containing all details regarding the housekeeping and general function of the facilities within Florida Delight is always readily available for your convenience within the villa. Contact details for the Management Company are found within the information pack. The Management Company are able to provide you with a range of additional services including Mid Stay Cleaning, a Welcome Pack of food essentials and a Meet and Greet at Orlando International Airport. Details and prices for these additional services can be provided upon request. Florida Delight is strictly non-smoking throughout (including the pool deck) and we also ask that guests refrain from bringing pets as no animals are allowed in the villa. From the moment we receive an initial enquiry about staying at Florida Delight we aim to respond within 2 hours, whenever possible. We are readily accessible via email or phone to answer any potential questions and throughout the process. Upon arrival it is important to us to make phone contact within the first 24-48 hours to check that everything is as they would expect within the villa and answer any questions they may have. There is also our local Management Company based in Orlando who are on-hand to help our guests should anything arise. Our guest reviews are very positive about the high level of support and interaction they received from us as owners. 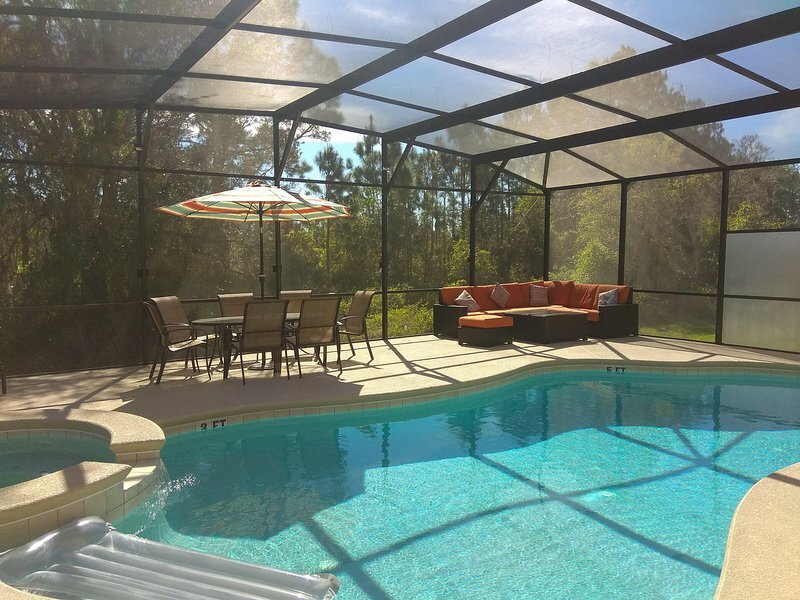 We have been visting the Orlando area for 15 years and this is the best villa we have stayed in. It is located in Watersong, a very quiet and beautiful place that is gated so you feel very secure. And the villa is every bit as good as the pictures suggest. There were five of us so there was plenty room for all and we particularly liked the bedroom layout upstairs - our master was at one end and the other master and queen rooms at the other so we felt that we had our own place to escape to! The deck area around the pool is larger than usual and luckily, we could use it all even in December because we were fortunate enough to have lovely weather. The warm pool was a favourite with granddaughter Jasmine! Watersong is less than half an hour's drive to the theme parks and the villa was a great place to return to at the end of a busy day. Beautfully kept and very clean, we would not hesitate to recommend it to anyone looking for a special place for their Florida holiday. And owners Richard and Nichola go out of their way to ensure a troublefree stay. We are a couple in our 30s and travelled with my parents who are in their 60s for a relaxing Christmas/New Year break. This property was perfect for us as it meant each couple practically had a 'wing' each. It would also be ideal for large family groups or 2/3 smaller families sharing. The property was beautifully decorated (exactly as it appeared in the photos) but what the pictures don't get across is the size of the place, it's huge! Perfect for large groups getting together but also lots of different areas for everyone to find their own space if they need some peace and quiet. The extended pool area meant that even in the winter, we were able to get the sun all day. The privacy screens at the side and no properties at the back meant that it felt very private. We requested pool heat, which made it the perfect temperature for our winter break. We basically spent most of the fortnight floating in the pool using the floats provided, a lovely touch! My Dad was in his element as he was able to watch more Premiership football games on the TV than he would get to see at home, while my husband escaped to the games room or the PS4 area whenever he got the chance. The management company were very responsive when we called to report one small issue, they arrived within a couple of hours and it was sorted. Richard and Nicola were fantastic during the booking process and beyond. They responded promptly to all of our queries and even rang us on our first full day to check we were enjoying it. They also returned our security deposit extremely promptly - I can't fault the service they provided. We have recommended this property to a number of our friends since returning but unfortunately (for them) they haven't been able to book as their dates aren't available. It looks like this is becoming a very popular property so my advice would be don't wait, book up quickly, you won't regret it! Our first USA visit, pleasantly surprised at the opulent, comfortable and extremely tasteful house. To wake up to storks calling and viewing colourful bird life was magic, as was the many local places we visited, especially Bok tower and gardens and also the nesting bald eagles, the white-tailed deer and armadillos at a nature reserve will stay in my memory of this superb holiday. And the visits to Ocean World, Universal Studios and the giant shopping mall which specialised in "designer label" outlets at a 70% discount are not to be missed. But I was not too sure about the over-generous helpings at American restaurants though . . . phew! A remarkable, pleasing and magnificent two weeks which flew by. --Mr. and Mrs. John F. Haliday, from Sussex, England. Response from the owner Hi there …we would like to thank you for your kind comments regarding your stay at Florida Delight. We are so pleased that for your first US visit that you chose to stay with us. Can we thank you for your custom and look forward to you staying again with us in the future.